Primera's new LP130e Laser Marking System is built to be used right on your desktop or workbench, making the laser marking process easy and convenient. It's used just like any other Windows®-based printer. 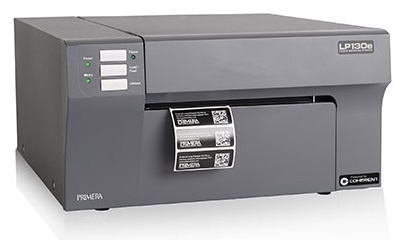 LP130e is delivering all the advantages of highly-durable laser label marking but at a much lower cost and with far greater simplicity than ever before without special operator training. Despite its many advantages, laser marking of durable label film has always been a complicated and expensive process. It required highly-trained operators, a large capital equipment investment, lots of maintenance, and a secured work area for safe operation. Primera’s new LP130e Laser Marking System changes all of that. It’s built to be used right on your desktop or workbench, making the laser marking process easy and convenient. It’s used just like any other Windows-based printer. The main difference is that LP130e contains a high-powered solid state diode laser. The laser either ablates or phase-changes a wide range of specialty label substrates, delivering all the advantages of highly-durable laser label marking but at a much lower cost and with far greater simplicity than ever before. Labels produced with the LP130e Laser Marking System withstand harsh outdoor weather conditions for many years, extreme sunlight/UV exposure, extreme temperatures from cryogenic cold to glowing heat, high abrasion – including blowing sand and dirt, tampering due to available tamper-evident features, chemicals (such as grease, oils, gasoline and many other chemicals). Labels produced on LP130e are designed to be replacements for etched metal plates as well as thermal-transfer laminated polyester bar code labels. Both "smoke" and "smokeless" types of substrates are available. No special operator training is required for LP130e. Software called NiceLabel SE for Windows XP/Vista/7/8 is included. The machine's compact footprint allows you to place units where they're needed instead of depending upon a larger, far more expensive centralized unit. LP130e meets CDRH and IEC laser safety standards, too. It includes safety features such as a dual interlock safety switch on the top cover. Labels in a variety of sizes are easily replenished. • Harsh environment labels – any other labels such as safety warning labels that are used in rough outdoor weather conditions. Label substrates that generate smoke and fumes require the use of Primera's DF-30e Filtration System. DF-30e is mounted directly underneath the LP130e and attaches without tools. It has five filtering stages: a baffle filter, a pre-bag filter, MERV-13 large particle filter, a HEPA small particle filter and an industrial-grade carbon filter for odor removal. DF-30e lets you safely use the LP130e in most office, warehouse and factory environments.